Judy Garland’s life was stranger than fiction. An international star since the age of twelve, the arc of her professional success and personal pain is a study of a life lived in extremis. Accolades and addictions went hand in hand. Triumph and tribulation, too. Could there be a story better suited to the stage? I think not. Though her life has seen its share of … how shall we say? … creative adaptations – Adrienne Barbeau as Judy in The Property Known As Garland will go down in my personal theatergoing history as a camp classic par excellence – Peter Quilter’s award-winning 2005 play End of the Rainbow focuses on the legend as she prepares for what would amount to a final career comeback at London’s Talk of the Town, just three scant months before a fatal overdose. After successful runs in Australia and the UK, the play finally lands on Broadway with a jolt of electricity I can only describe as seismic. 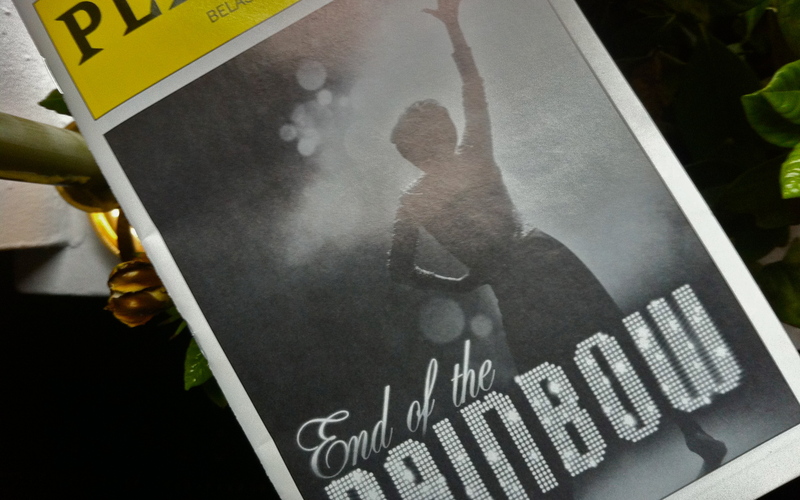 It’s not so much the quality of the play that kept me riveted to the edge of my seat but the roof-raising, star-making performance of Tracie Bennett as the singular Garland. I won’t mince words, this could easily have turned into a catastrophic exercise in caricature (see Barbeau, above). Yet Bennett transcends mere mimicry and fully invests the woman with an excruciating vulnerability that’s at times almost too painful to witness. Emotionally this Garland is like a cat skinned alive, at the end of her tether and tenaciously struggling with inner demons both inspiring and all-consuming. As her adoring (gay) accompanist Anthony, Michael Cumpsty is an adept, if occasional, foil along with Tom Pelphrey as musician Mickey Deans, the final fiancée who both orchestrated her comeback and enabled its demise. But let’s be honest, the men in Garland’s life were little more than extravagant accessories and the same holds true here. The truly spine-tingling moments take place when Bennett is left alone on stage, performing a handful of Garland’s most memorable songs with show-stopping humor and gusto. It’s like stepping through a looking-glass: you’re in London, 1969, and one of the 20th century’s greatest artists is giving you everything she’s got – and then some. Try and remember the last time you saw a play where the audience roared for an encore. Now hightail it to the Belasco, where it happens nightly – and the audience only exits the theater reluctantly.